On Friday 16 November there were risk assessments a plenty flying round as student from a Mechanics class led by Key Stage 5 coordinator Gareth Jones embarked on a journey into the third dimension. 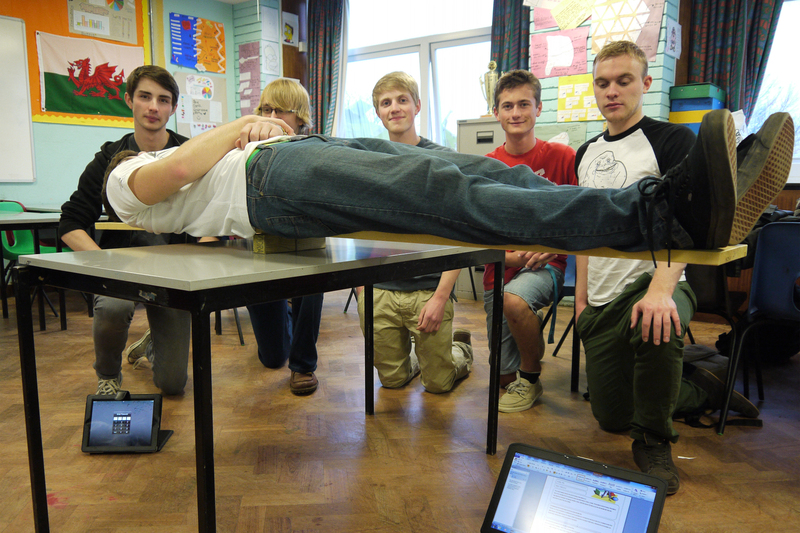 Normally the biggest risk in an A-level classroom is answering a question wrong, but in this lesson, one mistake in the calculation and willing volunteer James Williams would plummet to certain death – well maybe not death but it would have hurt a bit! To start with readings were taken at either end of the scales with Specimen J (James) laying across it. This measurement of mass was then used to calculate the ‘moments’ which were at work on each end. With the readings done it was time to calculate the exact point along the 6ft plank to place the small block of wood that would act as a pivot. As the board was mounted for the results of the calculation everyone held the breath. Not content with the risk of injury however, and sure of the accuracy of the mathematics used, Enrichment Coordinator for Mathematics Scott Wieprecht also placed his iPad and Laptop underneath each end. 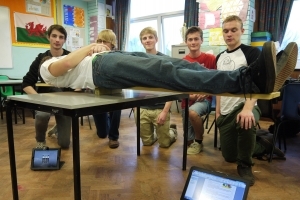 Luckily for all concerned the workings were correct and James remained perfectly balanced on top of the board whilst his fellow classmates posed for pictures. Once again saltash.net proves there really isn’t anything boring about A Level Mathematics.